The Telaire 7001 hand held Carbon Dioxide sensor feature patented Absorption Infrared technology. Each sensor measures CO2 and Temperature and can calculate and display real-time ventilation rates. When combined with the HOBO U12 or ZW Series it can record CO2 and when connected to the H22 or U30 Series can record Temperature & CO2. 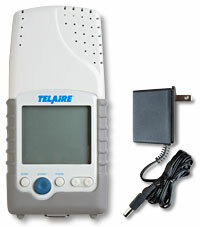 The Telaire comes with an adapter but also operates up to 70 hours on 4 AA batteries (not included). Temperature Dependence: ±0.1% of reading per °C or ±2 ppm per °C, whichever is greater, referenced at 25°C. Calibration Interval: 12 months Full factory calibration available by contacting GE Measurement & Control Solutions. Output: 6 VDC, 500mA output. 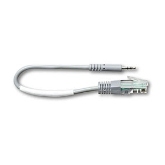 Power Connector: Round barrel with 2.5mm ID , 5.5mm OD, 12mm long, center positive (+6 VDC), outer shell ground.